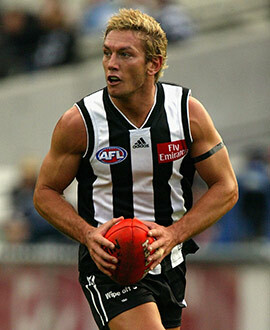 Collingwood couldn’t believe its luck when a Brownlow Medallist landed in its arms at the end of the 2002 season. But that’s exactly what happened when Woewodin, the AFL’s fairest and best player of 2000, left Melbourne and began the next chapter of his career. The blond haired Woewodin was a decorated player at the Junction Oval, winning the Demons’ best and fairest in 2000 and playing more than 100 consecutive games since his debut in 1997, a run that included the 2000 Grand Final loss. The son of a Ukrainian immigrant, Woewodin was famous at Melbourne for his fastidious attention to detail in preparation. His dietary preparation was one of the most detailed ever undertaken by a League footballer as he underwent tests to determine what time of day he should eat and what foods would benefit his body most. Collingwood gave up selection No. 14 (Daniel Bell) in exchange for Woewodin and received good service from the left-footer over three years. Woewodin polled three Brownlow votes on debut, winning 24 disposals and kicking a goal against Richmond in the first round of 2003. He put in another best on ground showing against Adelaide in round seven, collecting 32 disposals and kicking two goals in a famous win in enemy territory. He continued to perform credibly as the year progressed, polling the maximum votes against arch rivals Carlton (round 17) and Essendon (round 22). A veteran of Melbourne’s 2000 Grand Final, he began the 2003 decider against the Lions by kicking Collingwood’s first goal of the day from in front of the MCC Members stand but had just 12 more touches for the afternoon as Brisbane stormed to a 50-point win. Woewodin produced his most consistent season in a Black and White jumper in 2004, making a steady start before settling into a solid year in which he failed to miss a game for the third year running and tied with Ben Johnson and Paul Licuria for second place in the best and fairest. Unfortunately, Woewodin’s career came to a halt the following year when, despite playing 15 games, it became apparent that his pace had deserted him as the Magpies slipped to 15th spot on the ladder. A strong finish to the season, capped by two goals and 20 disposals against the Bulldogs in round 22 (his 200th senior game), gave him hope of continuing his career at the highest level. After he was delisted, he trained at North Melbourne but was overlooked on draft day, bringing to an end a career that had its origins in the 1997 pre-season draft.